The Android 6.0 Marshmallow update for Android Wear had somewhat of a troubled story. It actually launched back in November on the ill-fated LG Watch Urbane 2nd Edition LTE. LG pulled this model from the market after six days, due to faults with its P-OLED screen. The Marshmallow update for Android Wear seemed to sink along with it, not rearing its head until early February. As of now, the Marshmallow update has hit the Moto 360 (original, Sport, and second-gen), and will be spreading to all Android Wear watches over the next few weeks. Look for an update to Android Wear version 1.4.0.2580363. What else is new, besides the build number? The new additions focus on voice actions and gestures, alongside other very welcome features which we'll go over below. By saying "OK, Google" you can now initiate texting or ask a question and search Google for the answer. You'll also be able to send messages by voice through messenger apps like WhatsApp, Hangouts, Nextplus, Telegram, Viber and WeChat. And if you happen to own a Huawei Watch or the larger 42mm Asus ZenWatch 2, you'll be able to make and take calls via Bluetooth, and listen to audio and video messages with the Glide app. - Go back on a card by holding your arm in front of you and quickly pivoting up, then bring it back slowly to the original position. - Open the apps menu on the watch face by holding your arm in front of you and pushing down quickly. - Exit to the watch face by holding your arm in front of you and shaking your wrist quickly. Android Wear now supports speakers. If your smartwatch comes with a built-in speaker, you can use it to listen to audio messages and make calls directly from the watch. In case you didn't know beforehand, the Huawei Watch and the ASUS ZenWatch 2 (49mm) ship with dormant speakers for instance, and with the update these should wake up and function. - Added 6 new languages. - Doze mode (preserves your watch's battery life by shutting down background processes). - Extra app permissions to manage what you are sharing. - Manual date and time setting, independent of the paired smartwatch. - Bluetooth headset audio improvements to eliminate choppy audio when on the move. Roll on the 3rd gen smart watches later in the Summer or Autumn, hopefully they will all be 3 to 5 mm thinner thickness making them more watch like & lighter. 3 days battery life would also be welcome. Updated my Urbane last night. Checking for updates never triggered the update, so I did a factory reset and as soon as it was done syncing, the update was there. YMMV. 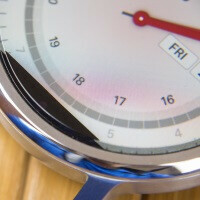 My G watch R just got the update as soon as I saw this article. I guess the only thing I "look forward to" is the battery life savings. The gestures are annoying anyway. I wonder if this will be the last update.